A new five-part series, ‘An Bronntanas’, has begun pre-production in Galway, with principal photography scheduled for next month. The five-part thriller, which will broadcast on TG4, is set against the backdrop of a local independent lifeboat crew working off the coast of Connemara. The storyline sees the rescue team struck with a moral dilemma when they receive a distress call one stormy night. They discover a dead woman on board a fishing boat which is carrying millions worth of drugs. The team must decide whether to bring the woman on shore and hand the drugs to the authorities, or leave the passenger and sell the drugs to save their struggling village. The original Irish language show has been developed by Galway-based production company ROSG and Northern Ireland-based DeFacto Films. Tom Collins (Kings) is directing and producing ‘An Bronntanas’ with Ciarán Ó Cofaigh co-producing. 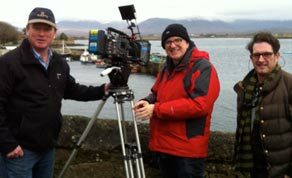 The series will be shot in various locations in Connemara during March and April, using the Arri Alexa. Cian de Buitléir is the DoP, with Cathleen Dore the line producer and Jason Carlin the production designer. ‘An Bronntanas’ is funded by TG4, the BAI, the IFB, Northern Ireland Screen/Irish Language Broadcast Fund. It will air on TG4 in 2014.